C4SS has teamed up with the Distro of the Libertarian Left. The Distro produces and distribute zines and booklets on anarchism, market anarchist theory, counter-economics, and other movements for liberation. For every copy of Kevin Carson’s “The Iron Fist Behind the Invisible Hand” that you purchase through the Distro, C4SS will receive a percentage. 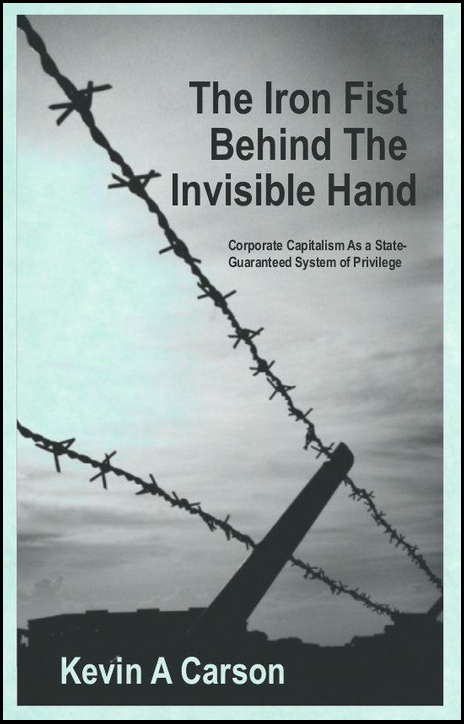 Support C4SS with Kevin Carson’s “The Iron Fist Behind the Invisible Hand”. Kevin A. Carson is a contemporary mutualist author and a prolific writer on subjects including free-market anti-cap­it­al­ism, the in­div­idualist anarchist tradition, grassroots technology and radical unionism. He keeps a blog at mutualist.blogspot.com and frequently publishes short columns and longer research reports for the Center for a Stateless Society (c4ss.org). Mutualism, as a variety of anarchism, goes back to P.-J. Proudhon in france and Josiah Warren in the u.s. It favors, to the extent possible, an evolutionary approach to creating a new society. It emphasizes the importance of peaceful activity in building alternative social institutions within the existing society, and strengthening those insti­tut­ions until they finally replace the existing statist system; doing whatever is possible (in the words of the Wobbly slogan) to “build the structure of the new society within the shell of the old” before we try to break the shell.